Callion Pharma is pleased to announce the introduction and availability of Aqua-E Concentrate, a unique, patented, water-soluble vitamin E formulation delivering 75 IU of vitamin E per mL. Formulated with TPGS, Aqua-E Concentrate contains a clinically proven delivery technology to enhance the absorption of vitamin E in conditions associated with malabsorption. 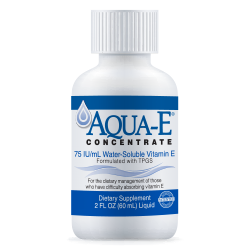 Aqua-E Concentrate is supplied in a 2oz bottle in a carton containing a graduated dropper. Aqua-E Concentrate is formulated for scaled dosing based on patient needs, and various dosages are easy to accommodate. It is odorless and has a neutral taste, so it mixes easily with most beverages, milk, and water, making it easy to administer especially in infants and children. It is also gluten-free with no added flavors or colors, assuring purity.